USA made starter drive for the 1928-31 Model A Ford. This is the complete 10 tooth starter drive for the model A starter with a 5/8" shaft. A Video technical seminar for the Model A Ford starter motor. Introduction: History of the Model A Starter, including some restoration tips. Part 1: Disassembly of your old starter. How to remove each component, cautions about protecting parts, cleaning advice and demonstrations. Part 2: Reassembly as a 6-volt starter. If you wish to restore your starter to the original 6-volt configuration, all you need to do is follow instructions of our experts. When you are done, and have repainted the newly rebuilt unit, it will look like it just came from the factory floor. Part 3: Converting your unit to a 12-volt operation. Many Model A'ers are converting their cars to 12-volt electrical systems and would prefer to use a 12-volt starter rather than a 6-volt starter. There are many potential problems caused by "firing up" a 6-volt unit using 12-volts of power...not the least of which is that sometimes things break, and that can be dangerous. Our experts show you how to make a starter that will be compatible with your new electrical system and last for many years of satisfactory use. Herb Neumann and Ron Accornero are the experts who take you on this guided exploration of the restoration process. Before you can think of a question, they have given you the answer. This video series is not made by professionals but by Model A Ford enthiusiasts, therefore please excuse any poor sound or picture issues. Running time 75 minutes. 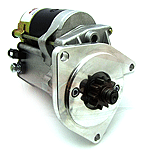 New USA made version of this popular modern starter drive. More reliable and perfect for withstanding 12-volt applications. (Not for early 1928 with 1/2" shaft). This tool makes the job of changing the modern starter drive, much easier. It compresses the drive so that you can get to the mounting screw easier. Brand new starter drive for the 1919 - 1927 Model T Ford. Kit consists of the Complete drive assembly, including the key. Starter drive sleeve for the 1919-27 Model T Ford. This sleeve goes at the head of the drive, and spins on the drive shaft. This is a modern Powerlite 12 volt negative earth replacement for the factory starter motor, except that you will need to change your wiring. You will need to add a V8 style push button starting button, in place of the factory fitted foot switch, or try our universal ignition switch below. This is a modern Powerlite replacement for the factory 6 volt positive earth starter motor, except that you will need to change your wiring. Starter Mount Set 1928-31. Set of bolts and lock washers to mount the starter. Made in USA. If you need a custom application, you can wire up your ignition with this traditional universal three position switch. Simply mounts to a 19mm hole and has 3 Positions, OFF / IGNITION / START, with spring-back from starter position. 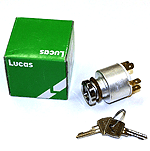 Genuine Lucas part, supplied with two keys. Starter Switch 1928-31. An exact reproduction of the original style starter switch. Cad plated. Made in USA. Starter Switch Gasket 1928 only. Goes between the starter switch and the starter. Made in USA. Starter Switch Insulator Kit for the Model A Ford starter switch, mounted on top of the starter motor. This kit gives you the insulators to insulate the terminal stud where it comes through the housing and the thick fiber cross that insulates the copper contact strap from the plunger. Starter Switch screw set for the 1928-31 Model A Ford. Screws and lock washers for mounting the starter switch. 8 piece set. Improper screws can cause a short against the fields. Made in USA. Starter Switch Nut for the earlier 1928-30 Model A in copper. Thin 5/8" diameter nut used on starter switch terminal. Kit includes 2 nuts and one shaker washer. Made in USA. Starter Switch Nut for the 1930-31 in Brass. Thin 5/8" diameter nut used on starter switch terminal. Kit includes 2 nuts and one shaker washer. Made in USA. Starter Switch Nut for the 1931 in Steel. Thin 5/8" diameter nut used on starter switch terminal. Kit includes 2 nuts and one shaker washer. Made in USA. These were correct from February 1931 onwards. This is a universal threaded stud kit for your model T or Model A starter motor. Model A's normally have a flat contact button on the starter, but if you would like to use a modern starter solenoid, this threaded stud makes it easier for attaching a battery cable. Stud is 3/8" x 1-3/8". Starter Rebuild Kit for the 1928-31 Model A Ford. All of the small hardware brushes, and springs for your starter. This can be used for most model A starters. Just remember that the very early one had a different size end bush (.688 O.D), so you may need to order these bushes as well. Made in USA. 28-31 Starter Armature A-11005-D. This is a new unit, not a rebuild. Not for the early 1928 with the 1/2" shaft, This is the later unit with the 5/8" shaft. Armature Thrust Washer for the 1928-31 Model A Ford. End Plate Bushing 1928-31. 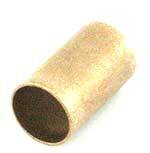 This bushing is used in the end plate of the starter opposite the drive end. (Brush end) Made in USA. Model A Ford and early Ford V8 starter motor brush holder 1928-34. Starter Brush Set for the 1928-31 Model A Ford starter motor. Starter Brush Spring 1928-31. Keeps the brush against the armature. Made in USA. Starter motor brush holder Insulator 1928-31. Made in USA. Starter Rivet Insulating Washer 1928-31. Made in USA. Starter Brush Holder Rivet Insulator 1928-31. Made in USA. Starter Fields 1928-31 6-Volt. Top quality fields for the model A starter. Made in USA. Starter Fields 1928-31 12-Volt. Top quality fields for the model A starter. Made in USA. a lower priced set of 12 v Starter Fields for the model A starter. Starter or Generator Pole Screw 1928-31. This screw usually takes a beating getting it out. It is the screw that goes through the casing, and holds the heavy steel plates that hold the fields in place. Made in USA. 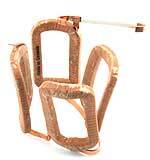 Starter Field Coil Insulator 1928-31. Wraps around the starter housing inside to prevent shorts at the end of the fields. Made in USA. This is the bronze button on the starter casing that makes electric contact with the starter switch. Five piece set including three fibre insulating washers and one fibre insulating bushing. Note: This button will not fit the 1928 to mid 1928 Abel starters. Starter Field Terminal Insulator 1928-31. Starter Field Terminal Insulator 1928-31. Made in USA. Fibre Starter Field Terminal Bushing for the 1928-31 Model A Ford starter motor. Starter motor contact insulator for the 1928-31 Model A Ford starter motor. Made in USA. 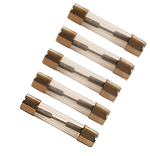 This is a duplicate of the original band that covered the slots for adjusting the brushes. Comes with hardware. Made in USA. Starter Shim 1928-31. Place these paper gasket type shims, between the starter and the bell housing to adjust the gear meshing. Made in USA. 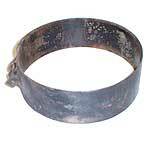 Starter Rear Armature Washer 1928-31. Goes at the rear of the armature as a thrust. Made in USA. 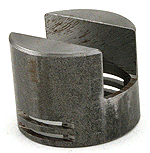 Starter End Plate Bushing 1928-29 688 O.D. These are used in the end of the starter plate towards the starter drive end (opposite of brush end). 1929-48 Starter End Plate Bushing 753 O.D. 1.155" long. These are used in the end of the Model A Ford starter plate towards the starter drive end (opposite of brush end). Also used on the rear of the 1932-48 V8 starter. Starter Drive Key 1928-31. Key used for mounting the starter drive to the starter shaft. Made in USA. 1928-31 Model A Ford original style starter drive. 5/16" special thin headed bolts and washers to hold the drive spring in place and to hold the drive on the shaft. Ford used 5/16" on some and 3/8" on others. Set of 2 bolts and 2 washers. Made in USA. 3/8" special thin headed bolts and washers to hold the drive spring in place and to hold the drive on the shaft. Ford used 5/16" on some and 3/8" on others. Set of 2 bolts and 2 washers. Made in USA. Starter Drive Washers Only 1928-31 5/16". Special thin headed bolts and washers to hold the drive spring in place and to hold the drive on the shaft. Ford used 5/16 on some and 3/8 on others. Made in USA. 3/8" Starter Drive Washer. Special thin headed bolts and washers to hold the drive spring in place and to hold the drive on the shaft. Ford used 5/16 on some and 3/8 on others. Made in USA. Starter Spring Clips 1928-31. Originally offered by Ford to support the drive spring and help keep the bolts from bending. These only work on drives with 5/16" bolts. Made in USA. Starter Rod for the 1928-31 Model A Ford. 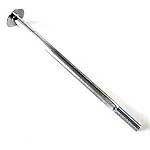 A cadmium plated rod for the starter switch. Made in USA. Starter Rod Cover for the 1928-31 Model A Ford. This pad slips over the flat head of the starter rod so your foot won't slide off. Starter Rod Cover 1928-30 Grommet. This style starter rod grommet & cover was used from 1928 through August of 1930. Your firewall will have a D-nut on each side of the rod hole. Made in USA. Starter Rod Cover 1928-30 Grommet Cover. This style starter rod grommet & cover was used from 1928 through August of 1930. Your firewall will have a D-nut on each side of the rod hole. 1930-31 Starter Rod Cover Grommet. This style starter rod grommet & cover was used from September 1930 until the end of production. You will have 3 small rivet holes around the rod hole. Made in USA. 1930-31 Starter Rod Cover. This style starter rod grommet & cover was used from September 1930 until the end of production. You will have 3 small rivet holes around the rod hole. Made in USA. Starter Rod cover Mount Rivet/Screws 1930-31. 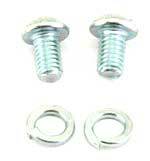 Set of 3 tubular rivets or screws, nuts and l/w's to mount the A-11481-B starter rod grommet cover. Ford Service Bulletins allowed the dealers to reattach the cover with screws instead of rivets for ease of installation. 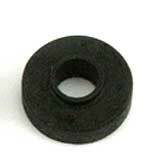 Starter Rod Grommet 1930-31. If you have a firewall that just has a single hole that is about 7/8" around where the starter rod goes through, then you will need this grommet. It was used on cars made from June 1930-November 1930. Made in USA.